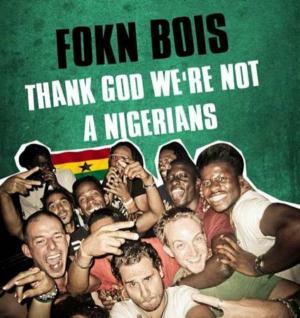 When purpose is not known abuse is inevitable and this is what I think of the FOKN BOIS of Ghana on their new album title "Thank God we are not Nigerians". They have no idea where this song lyrics would take this two countries that have built solid relationship and have come a long way of understanding each other. Ghanaian should not forget the past in hurry how helpful Nigeria was to them and how many Ghana community has found life worth living in Lagos and other major cities across Nigeria when situation in their country was horrible. There are still several Ghanaian in Nigeria today working or doing personal businesses in various parts of the country and they have been well treated, respected, enjoy same basic amenities without fault or charged. They got marry to Nigeria ladies and there's absolute freedom of expression for them, they are in various schools acquiring education like every normal Nigerians and same goes on other side of Nigerians in Ghana. I'm afraid this song would not generate more media attention in bad image of Nigeria as against initial thoughts of the artist which most Nigerians would not find as a joke. I personally condemn this thinking and don't be surprise of same lyrics coming from the Nigeria end in reaction to this stupidity of group that produced this song. The Ghana music industry should please scan this area properly and ensure no such thing further arise from artists in their region. There are more better ways to sell album than painting entire country bad. This sort of joke is provocative and might generate unnecessary hate between both countries.